The garage often becomes a dumping ground for everything. Seasonal items, like Christmas lights and snow sleds. Items that have outlived their usefulness, like old tires and bikes children have outgrown. Items you never really wanted in the first place, like the table you inherited from your favorite aunt or materials for a project you always meant to get around to, but probably never will. Storing the items listed above in your garage might not be aesthetically pleasing, but otherwise poses no problem. However, the garage often becomes home to a number of materials that shouldn’t be stored there. In some cases, it’s because the material poses a danger to your health and safety. In other cases, storing the item in the garage will render it useless. With that in mind, here are five things you should never store in your garage. Who doesn’t love a good barbecue? After all, cooking outdoors with family and friends can be fun. You already know that you should never grill inside your garage—even in the winter. Maybe you didn’t know that when you store your grill in the garage for winter it’s best to leave that propane tank outside. 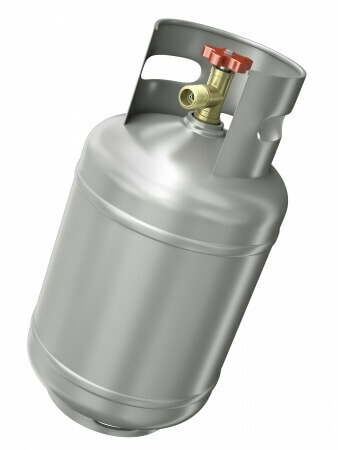 Frequently, the valve on a propane tank isn’t completely closed when stored. Occasionally, propane tanks leak. Propane gas leaking in your enclosed garage can cause a fire or explosion. Rather than risk it, consider storing your propane tank outside in a secure, enclosed space, like a backyard shed. There are many reasons clothing and linens might need to be stored. Sweaters and coats take up too much space in drawers and closets during spring and summer. Bedding, too, is often changed seasonally, requiring storage in off-seasons. However, your garage isn’t the place to store those items. Especially in the colder months, animals seek cozy places to burrow and make nests. If a raccoon or skunk wanders into your garage, the last thing you want is for him to feel at home and bring his family and friends. A box of sweaters or bedding left on the floor of your garage could easily become home to a family of unwanted guests. Instead, find someplace inside your home to store clothing and linens. Wherever you decide to keep seasonal clothing and bedding, consider storing it in sealed plastic containers that will keep animals and insects out. A growing number of families are adopting an environmentally-conscious lifestyle, which is to be applauded. For many, going green includes recycling, which is beneficial for the planet and can have a positive impact on your family’s budget. However, if done improperly, recycling can cause headaches and an added expense—pest control. Store stacks of old newspaper and other paper goods in your garage and you’re extending an invitation to mice and other pests to come on in and get cozy. Discarded newspapers, paper plates and any other paper goods make great building materials for nests or a ready-made, toasty warm spot to sleep and raise a rodent family. Looking for a cool place to store root vegetables, dog food, bird seed or foods packaged in cardboard boxes? The garage might seem like an ideal and convenient place for these food items. Problem is, animals and insects find it pretty convenient, too. If keeping the two previous items in your garage makes it a potential hotel for mice, stockpiling food there makes it a luxury hotel with a five-star restaurant. Good for pests; not so good for you. Find a place to store food items inside your home instead. While we’re on the subject of consumable items, wine is another that should never be stored in your garage. Wine is temperature-sensitive. Your garage might seem like the perfect place to store cases of wine. However, the temperature in an unheated garage can fluctuate substantially. Exposure to extreme heat can potentially damage the composition and color of wine stored in your garage, making it unpalatable. This makes for a disappointing and potentially expensive loss. Wine is best stored in a climate-controlled space. However, it isn’t the only item that’s sensitive to temperature. House paints stored in your garage can also be ruined by extreme temperature fluctuation. The extreme heat and cold to which a typical Canadian garage is subject will cause a marked change in the consistency of the paint, ruining it. Some paints separate, like oil and vinegar in salad dressing. Only in the case of paint, you’ll be left with a curdled, unusable mess. Leftover paint is best stored in a cool, dry basement. If that isn’t an option, look for another space inside your home that is temperature-controlled and has limited moisture. Before you put those cans of paint away, record the color information somewhere safe, in case you need to have another batch made. There are a variety of items that can be safely stored in your garage. However, for your health and safety, it’s best not to store your propane tank, clothing and linens, paper goods, food or temperature-sensitive items like wine or paint among them. Looking to maximize the storage space in your garage for items that do make the cut? Contact a garage renovation specialist to set your garage organizational project in motion.